A revolutionary new funding platform for sports teams and societies. Access amazing discounts and deals and at the same time raise vital funding for your team. TeamFirst App: Raising the game. The world’s first crowd-raising platform. With TeamFirst, you can raise money for your team and save yourself money in the process. Save yourself money everyday with TeamFirst. Simply download and immediately access exclusive, mouthwatering discounts and deals in major stores such as Nandos, Subway, Yo! Sushi, MyProtein, Krispy Kreme and ASOS. Sign up your society or team. Generate ‘supporters’ to sign up and ‘follow’ your team and society on the app. 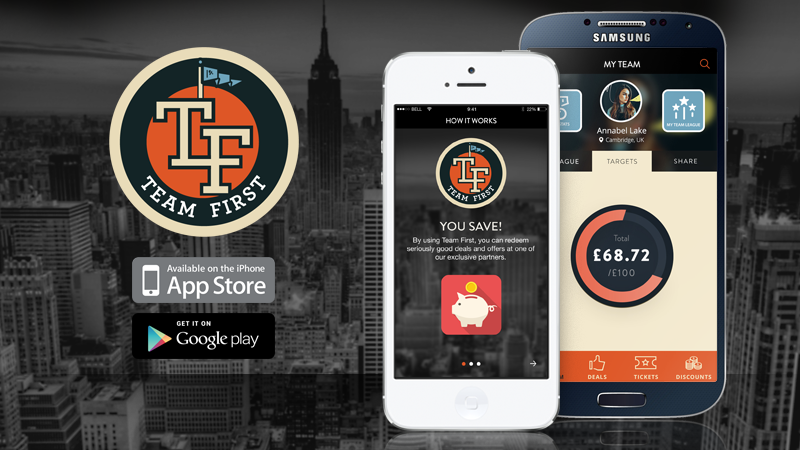 Every time yourself or any of your supporters use the app and redeem on of the TeamFirst deals, money is raised for your team and society. Track your funding progress and compete against other teams and societies in competitions to win significant prizes. Everything from £2000 for your team and society or free Nandos for a year. Sign up your team and society straight away and instantly begin your fundraising journey. Save yourself £1000’s and watch the money you raise for team increase as you strive to reach your goals!